Come on heirlooms!! The last tomatoes to ripen every summer. Making me anxious about the fair. I need two ripe tomatoes of the same variety. The Howard County Fair starts Saturday, and I need to get my vegetables and herbs ready for entry. I currently am drowning in tomatoes, and getting ready to process some tomorrow. Unfortunately those heirloom tomatoes on the tray are from the CSA, and not my garden. I have at least five German Johnson that are close to ripe. I hope to pick them Tuesday or Wednesday. I have enough cherry tomatoes to enter, and enough plum tomatoes. Need a couple more medium early girls to get the minimum for submission. Besides tomatoes, this year I have enough onions to enter. There were 24 onions left in the ground last week. I had to find the five best out of them. Fun job. 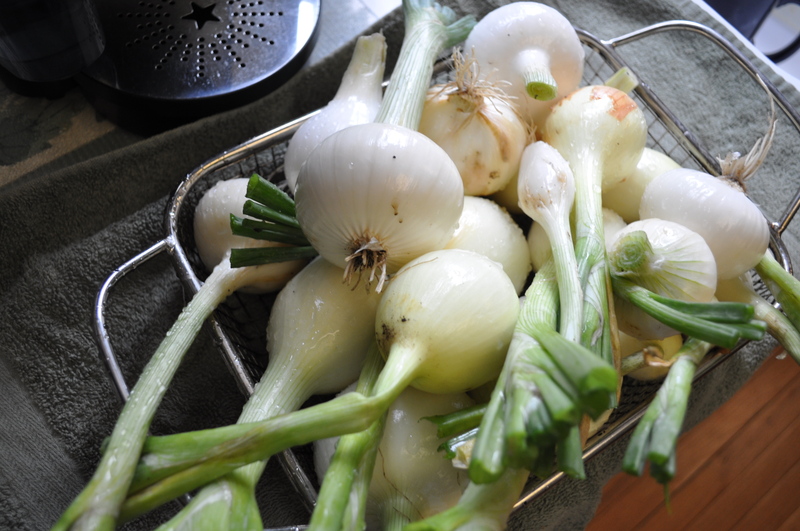 Besides the onions, I harvested the rest of the leeks and the shallots. 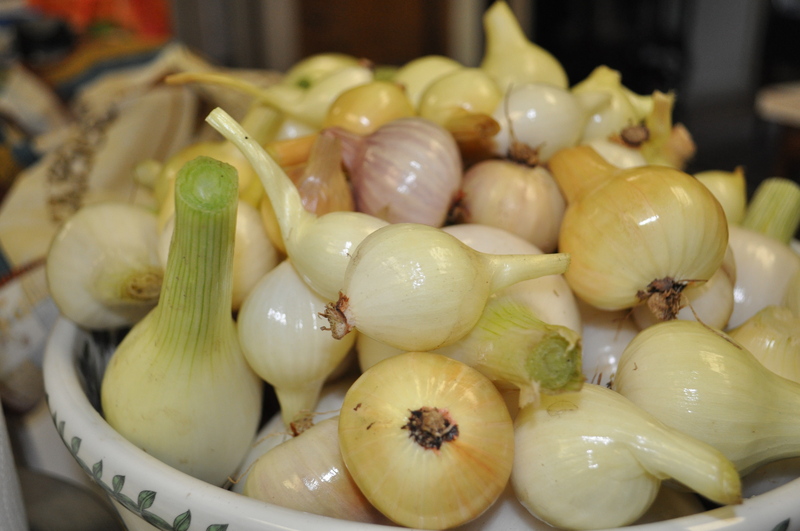 My onion/garlic/shallot bowl is overflowing. Time to do some roasting and get them ready for winter. I have herbs for entry. Just can’t figure out which ones I want to pick. And, finally, enough variety to make the vegetable display, which needs five different varieties of vegetables. 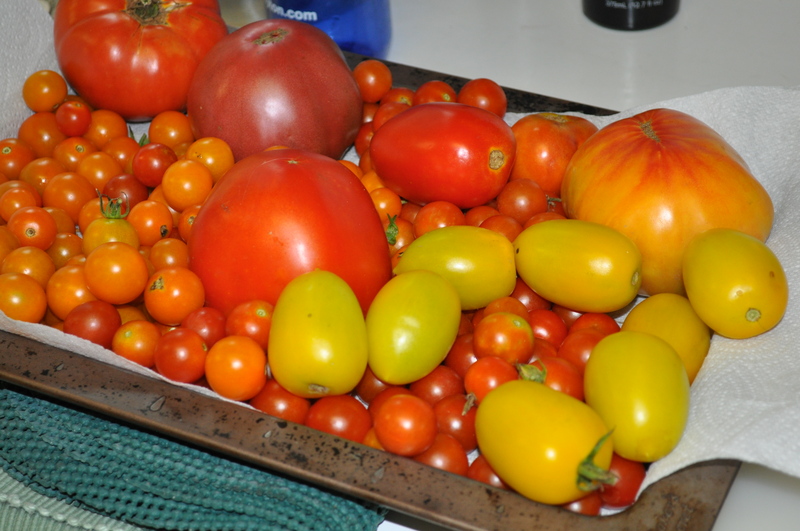 Posted in Food, Gardening, Hobbies, Howard County and tagged Food, foodie, gardening, heirloom tomatoes, hobbies, Howard County, tomatoes. Bookmark the permalink.